Amazon has released a new service that has somewhat flown under the digital radar of both businesses and consumers alike. Similar to its potential drone delivery service, some believed this new service, Amazon Dash, to be a joke, specifically an April Fool's prank since it was released so close to the "holiday." The reality, however, is that Amazon Dash is an Internet of Things (IoT) invention that has the potential to disrupt how participating brands (so far that's products like Huggies, Clorox and other household names) collect consumer data, how products are replenished in a home and how smaller brands are able to compete (or rather not compete) in this consumer products space. Amazon Dash is a "button" (it really works that simply) that is placed (using reusable adhesive and a hook) near favorite products in a home. When they are about to run out of the product, shoppers simply press the button (that is connected to a home's Wi-Fi connection) and Amazon fulfills the order. In additon to other brand benefits (like recurring revenue and greater brand affinity...more on that below), this could be one way that companies compete in a changing in-store environment, as the makers of such products like Tide are competing for shelf-space against the stores themselves (that offer their own products under a name like Private Selection or Market Pantry). It may seem wholly unlikely that a smaller consumer goods company could compete with the participating powerhouses, but Amazon is offering developers, makers and manufacturers the opportunity to integrate the same service that powers Dash Button into their product or services by either building a physical button into their hardware to reorder consumables or by measuring consumable usage so that reordering happens automatically (and all with roughly 10 lines of code). Amazon provides this example: an automatic pet food dispenser made with built-in sensors can measure the amount of pet food remaining in its container and place an order before running out. What kinds of data do you think Amazon Dash can provide participating e-tailers? Anil Kaul, Absolutdata: First of all, when consumers accept the Dash button they are sending a very strong signal about their brand preferences. Dash is very brand specific, so manufacturers and e-tailers will receive very valuable information about what types of people tend to be loyal to their brand. That, in turn, gives them the ability to target other similar products to these same people. Secondly, because Dash is based at the “point of need” -- the actual time and place where consumers need the product -- it facilitates the gathering of information about the consumer’s consumption rate of the product. When does the consumer run out of the product? How much are they using? Do they tend to buy more only after they’ve run out, or do they stock up? These are questions that Dash will be able to answer for e-tailers at a very individual, household level. How will smaller e-tailers be impacted by Amazon Dash? I think Dash, assuming it’s a hit, will have a strong impact on smaller e-tailers because right now, Amazon has only partnered with top consumer packaged goods brands on Dash. So if consumer participation in Dash continues to grow, the top brands will reap the benefit, giving them more sales volume and more marketing power. Conversely, the #3, #4, and those other brands down the line will be squeezed out of the consideration set for the product, and will experience a decreased market share as a result. Dash, if it takes off, will definitely limit the smaller brands’ ability to compete with the larger brands. 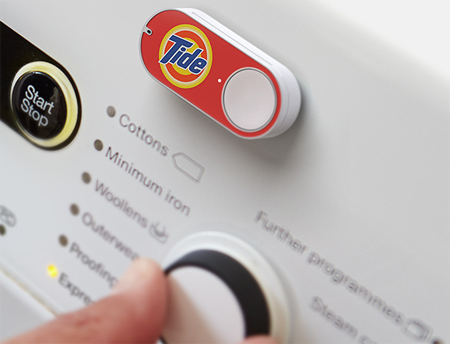 What impact do you think Amazon Dash will have on advertising budgets of participating e-tailers? Dash can have a profound impact on the budgets for participating e-tailers, since the Dash button essentially becomes the advertising medium for a certain segment of their customers. So if we were to presume that I am a major brand and 50 percent of my current customers are using the Dash button to buy my product, then I no longer have to reach that percentage of customers with any other kind of marketing or advertising, for the time being. That will free up a major portion of my budget to go after new customers that I don’t currently have. How much harder will non-participating brands have to work to get sales for the types of items offered through Amazon Dash? It’s pretty clear that the non-participating brands will have to work harder in a couple of ways. First of all, they will have to get their current marketing methods to work harder, since they are presumably losing a portion of their customer base -- and their potential customers -- to brands that are participating in Dash. Second, non-participating e-tailers will have to start thinking about new technologies they can use in order to compete with Dash’s placement in the home. Dash is moving the technology of buying products from the laptop and mobile phone, right into the home. E-tailers will have to innovate in order to compete with that and overcome it. How can they mimic that kind of data that will be at the ready for Amazon Dash participants? I think the answer to that lies in the one big drawback of Dash: currently, it requires a separate button for every product. So in order to receive the same kind of data e-tailers are getting from Dash, I can see things going a couple of ways. 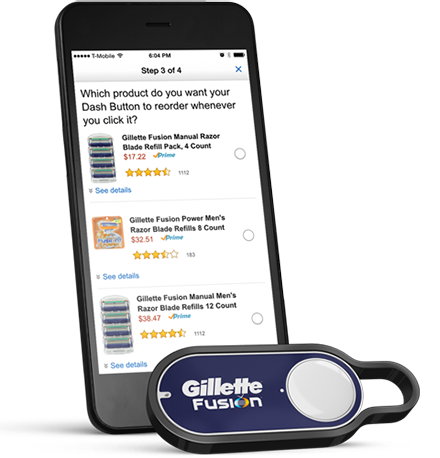 E-tailers might try to mimic the Dash button with some sort of “one-click-and-order “product button that resides on consumers’ phones. So there could be “brand” or “product” buttons on people’s phones that would make it almost as easy to buy product as Dash does. Secondly, I think smaller e-tailers can make sure they stay apprised about how the Dash technology is working and growing. Essentially, with Dash, Amazon has created a new channel: it is more “direct-to-consumer” than anything we have seen before. Given that, I think in the future there might be more of a screen-centric device placed in the home, at the point of need, which will allow for multiple brand messages to be directed at the consumer. So smart e-tailers will be anticipating that day, and start to think about how they can creatively persuade the consumer in a home setting to buy their brand, as opposed to others. Furthermore, if that were to happen, what kind of data would they be interested in collecting from that scenario and how might they use it? Why should businesses consider using Dash Replenishment Service? This is a very interesting aspect of the whole Dash phenomenon and smart e-tailers and manufacturers should really take notice. The Dash Replenishment Service allows device, appliance, product makers, etc., to actually build a re-order button into their product. So, for example, if you had one built into your washing machine there would be a button right on the machine that you could press when you need more detergent, and it would automatically be ordered through Amazon. This represents a major shift in the future business model. For consumers that have these types of devices with implanted order buttons, it could take away the decision they have to make about what brand of detergent to use, because they already, essentially, have made a commitment to a certain brand when they buy the machine. On the manufacturer side, this means a continuing revenue stream beyond just the sale of the washing machine, extending revenue to the consumables: the detergent for a washing machine, the ink for a printer, the coffee pods for a coffee maker….it goes on and on. There is a good possibility that the new business model will quickly shift to a more flexible screen-based device I described above. And smart consumer products organizations will begin to plan for this new channel sooner rather than later.